Our first offering from Nick Anger is a special one. 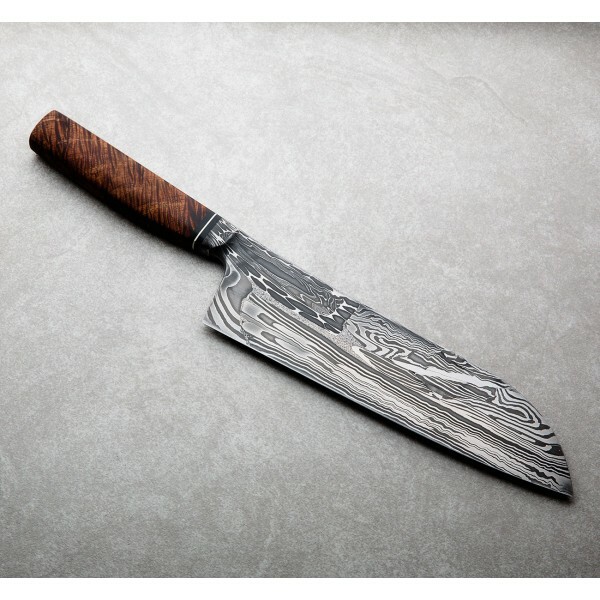 The 225mm blade is forged from a composite of various mosaic damascus patterns, each visually unique, allowing Nick to bring together 'many disparate parts into hegemonic usefulness.' In total six individual carbon steels are used. 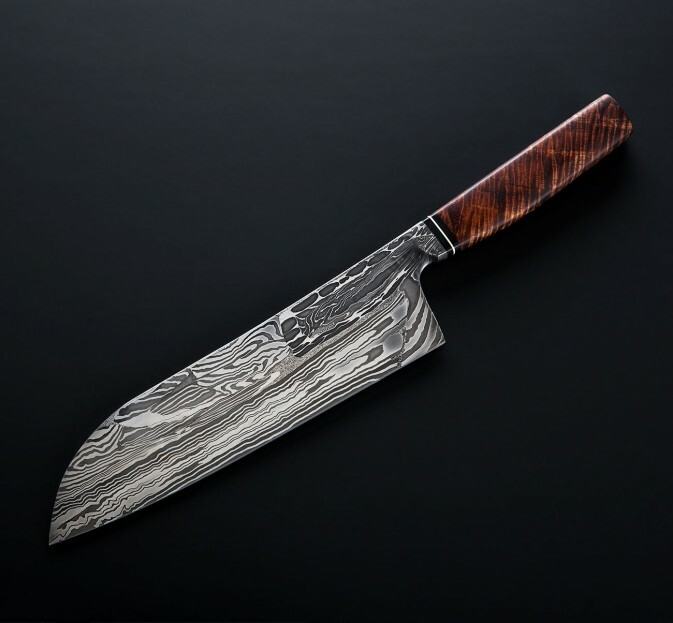 A tall, dark and beautiful culinary tool representative of Nick Anger's obsession with high-performance metallurgy, which, at the same time, allows no room for aesthetic compromise. 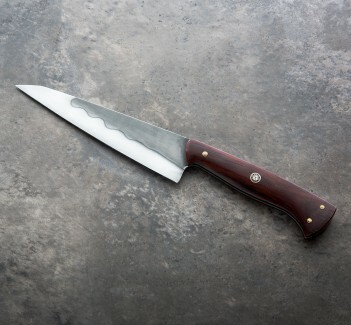 Gorgeous Grade 5A stabilized koa wood is accented with black G10 and a nickel silver ring, from which the handle's lines flow naturally into the integral bolster Nick is known for, and onward through the thin, tall blade made to chop all day, and all night. 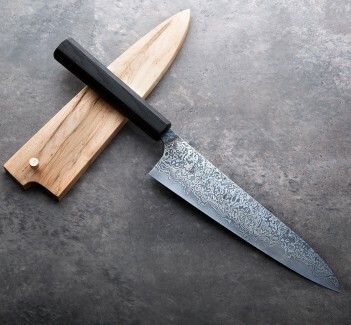 Bladesmith Nick Anger creates world-class chef knives at his one-man shop in the US state of Vermont. Nick's ability to create endlessly unique and always eye-catching designs is rivaled only by his penchant for uncompromised edge performance, achieved through a tightly controlled heat treatment, quenching and tempering process which he has honed for the steels and incredible damascus patterns he creates. We are proud to represent Nick's work at Eatingtools. 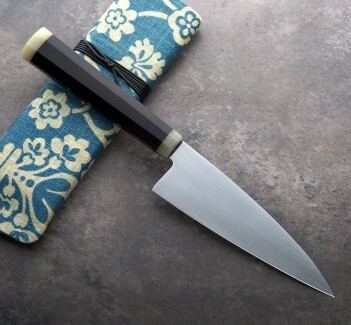 Blade length: 225mm / 8.85".  Overall length: 14.75". Blade spine width 1" in front of heel: 2.5mm. Blade height at heel: 58mm. Weight: 7.6oz / 216. Blade: Composite mosaic damascus containing 1095, 52100, 15n20, 1080, 1084 and 4800kc powder. Handle: Grade 5A stabilized koa wood, black G10 & nickel silver.